For this recipe, I am using the smaller ‘wood ear’ variety of black fungus, as described in the aforementioned ‘Foodstuffs’ post, but the ‘cloud ear’ type would be just fine. 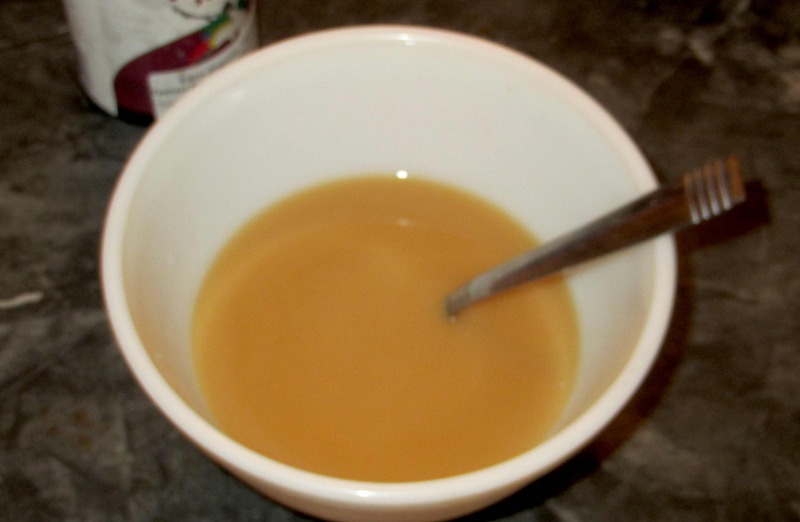 I used about a ¼ cup or so of the dried product in order to yield a cup when rehydrated. First, mix the chicken stock with the cornstarch/water mixture, the dark soy, sugar, and 2 tablespoons of the rice wine. Set this aside for now. 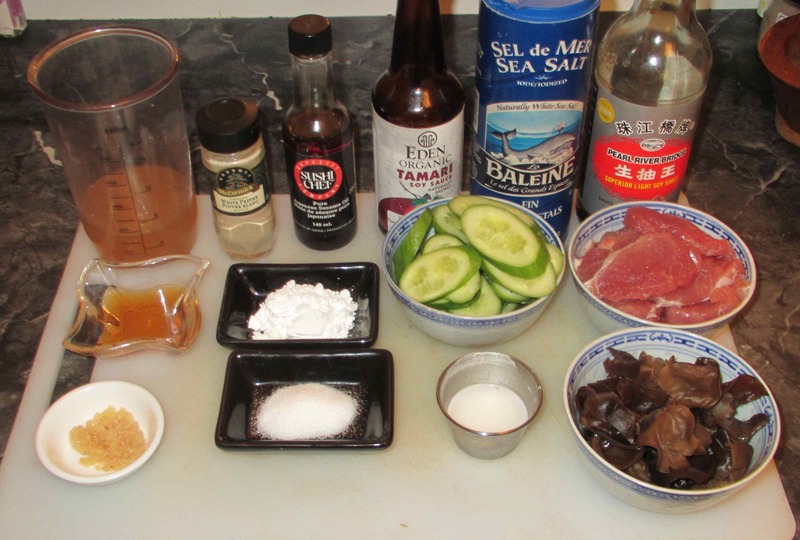 Now mix the meat with the remaining rice wine, salt, pepper, sesame oil, light soy sauce and the 2 tbsp. of cornstarch. 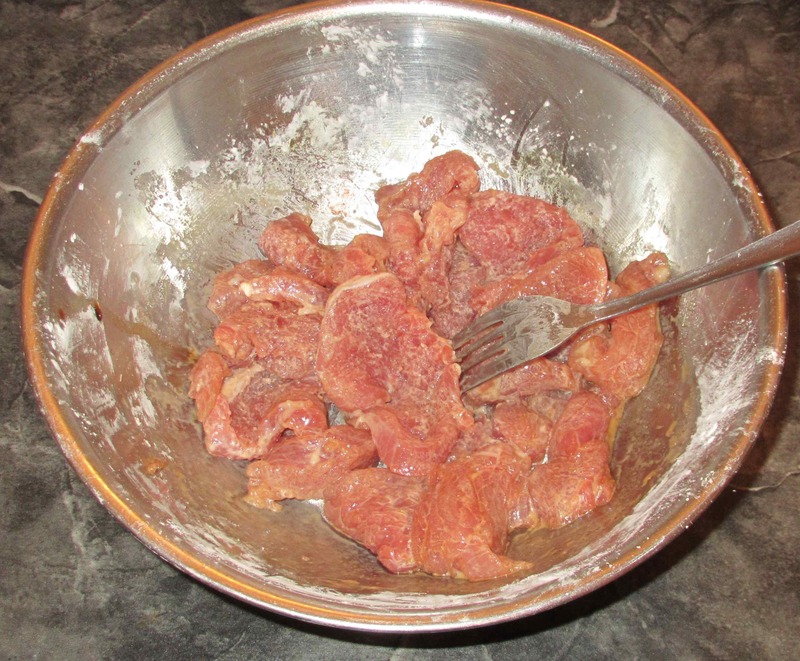 Stir well and leave to marinate for at least 30 minutes. 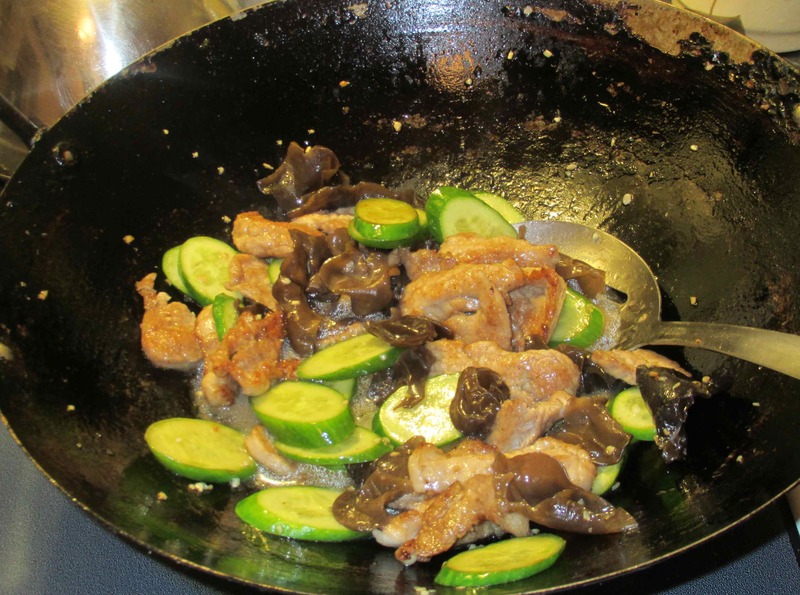 When you are ready to cook, heat your wok or pan over moderate heat and add three tablespoons or so of oil. 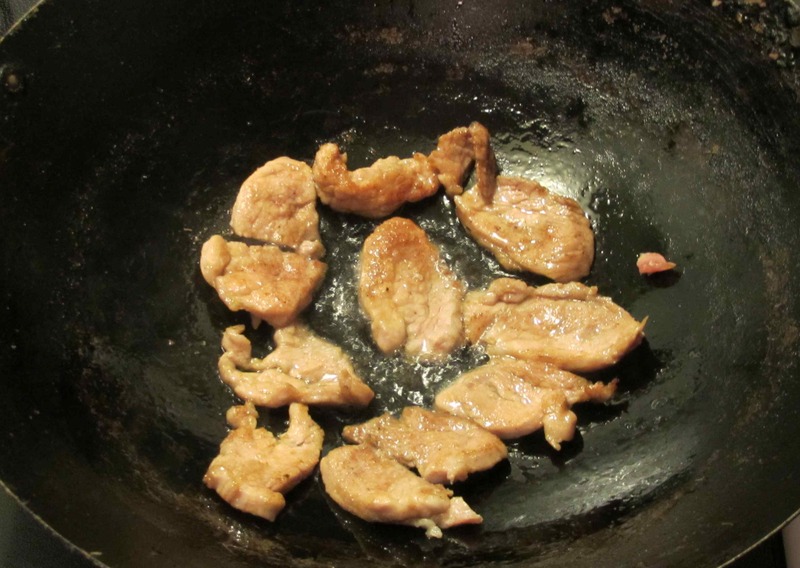 Once the oil is good and hot, sauté the pork slices in two batches, turning so that they lightly brown on both sides. When all are done, remove them to a bowl for the time being. Turn the heat to high and then add the garlic. As soon as it releases its aroma add in the fungus and the cucumber slices and toss continuously until they are heated through and the cucumber is just beginning to soften ever so slightly. Now add the meat back to the pan and toss for a few seconds. Add the chicken stock mixture and continue stirring and tossing until the sauce has cleared and thickened. Serve immediately. Great idea: cutting the cucumbers thicker to preserve crispiness! I don’t think I’ve ever cooked cucumbers before, I think I will give it a try. I can see it pairing well with the black fungus. I have eaten a dish similar to this, only it’s with Chinese squash. I will have to try it with cucumbers. Thanks for letting me know about another option! My pleasure. What sort of squash exactly… Winter Melon or Bitter Melon perhaps? I’ve got to stop reading this blog when I’m hungry! Everything looks so good! Very good and clever use of black fungus. 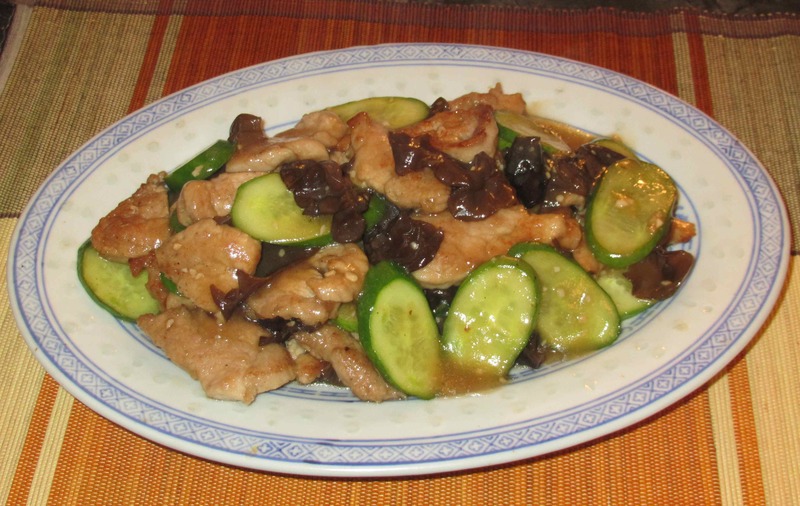 My mom recently made a braised pork dish with pork belly, ginger, fermented beancurd (nam yee) and cloud ear black fungus. One of our favourite comfort foods. Kudos to you for using this lesser known ingredient! I haven’t tried the fermented beancurd yet … maybe I can pick some up next week on Ottawa! Oh yum. 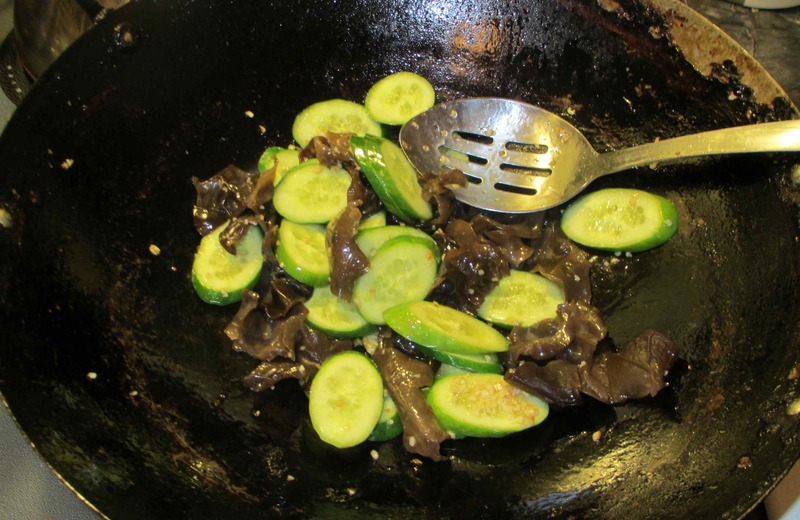 When I cook cucumbers and wood fungus, I cut the cucumber lengthwise, remove the seeds, and then cut each half on the bias. I tried it once with the seeds, but didn’t like the texture. Maybe I should try it again?